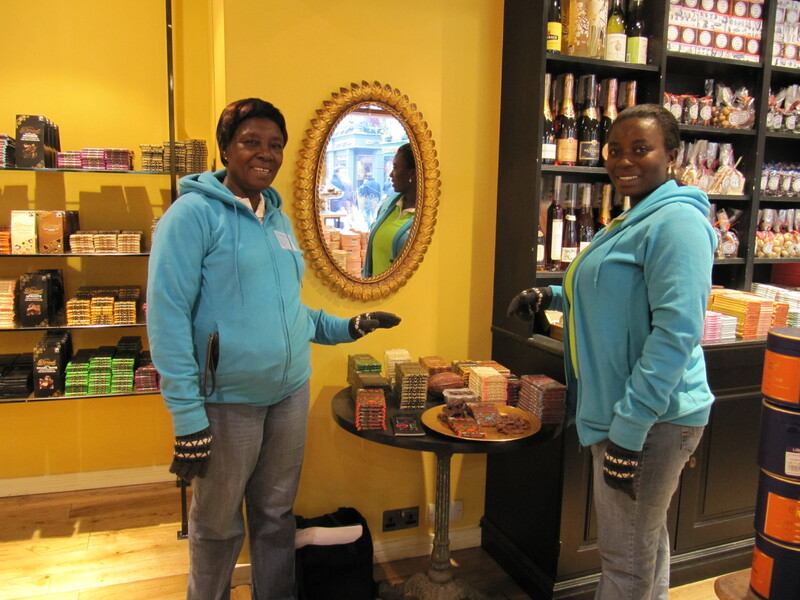 As well as offering a fantastic range of chocolate, Divine is here to give cocoa farmers a voice – and it’s so great to see the relish with which they take up that opportunity each Fairtrade Fortnight! 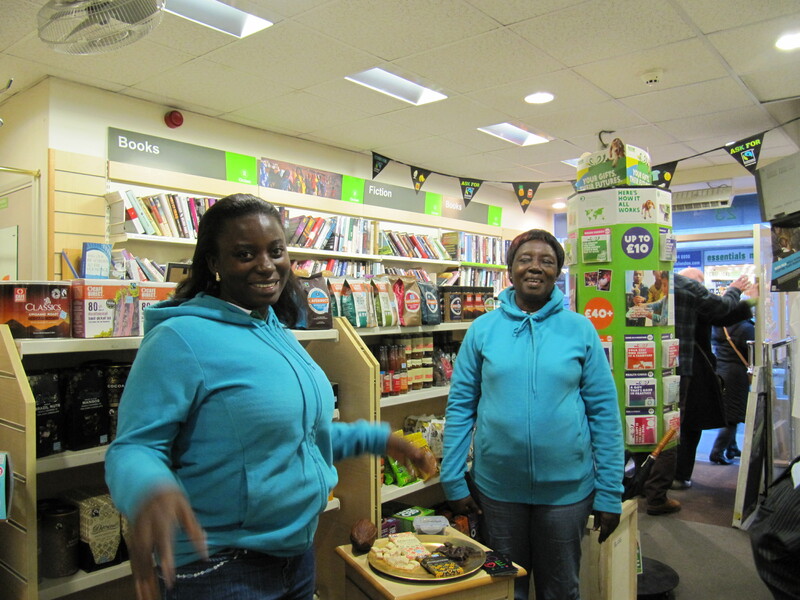 This year we were delighted to host a visit by Kuapa Kokoo members Mary Appiah and Esther Mintah Ephraim – both from the Western Region of Ghana, and both first time travellers to UK. Mary is 60, and comes from Enchi where she has a 7.5 acre farm. She’s been a member of Kuapa Kokoo for 6 years. Esther is 28, from Agyedum, and her family farm is 38 acres. 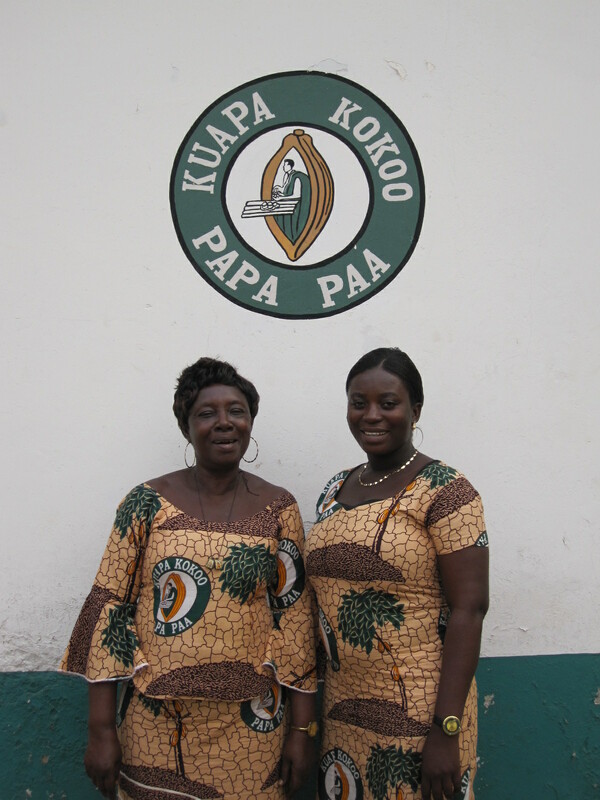 She’s been a Kuapa member for 8 years. As you can imagine, arriving in the freezing cold, and emerging from the plane in Heathrow Terminal 5 is quite overwhelming! But Mary and Esther not only took everything in their stride, but were open for all experiences and interested in everything they saw and heard. We had a very busy schedule arranged for them – ensuring they addressed really diverse audiences, and in turn discovered as much as possible about the UK chocolate market they supply (and lots of sight-seeing too). The farmers attended Fairtrade events at St Mary le Bow Church, at St Paul’s Cathedral, in Crystal Palace, and in Haringay – telling audiences about their lives, about the impact Fairtrade and owning Divine has had on them and their fellow members, and their hopes for the future.They toured a real mix of shops where Divine is stocked – delighting customers who weren’t expecting to meet cocoa farmers when they bought their chocolate – from Liberty’s to Budgens in Crouch End, and Whole Foods to Oxfam in Covent Garden. 8thMarch is InternationalWomen’s Day – and once again the Kuapa farmers were given the opportunity to participate in the international Women of the World Festival (WOW) at the Southbank Centre – amongst amazing women from all backgrounds and circumstances.Primary school St Barnabus in Tunbridge Wells, and Imperial College and Royal College of Art all hosted lovely events where Mary and Esther narrated a film showing how cocoa is grown, harvested and prepared to ensure it is “pa pa paa” and answered many questions about how belonging to Kuapa Kokoo has changed their lives. 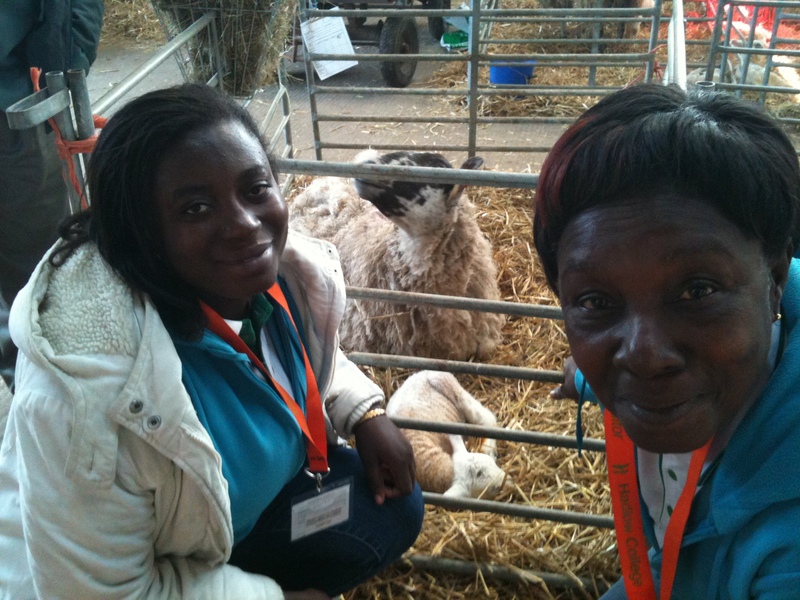 We also visited Hadlow College where Esther and Mary were able to share knowledge and experience with a whole theatre of farming students, including many international students from Africa. We were given a tour of the College farm – and the size of all the animals amazed them! 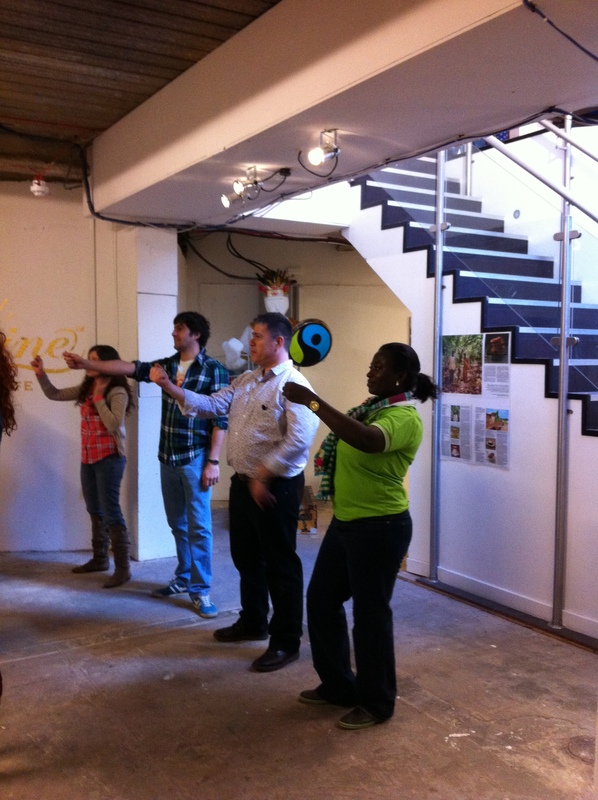 Last – but absolutely not least – Esther and Mary were very special guests at our fantastic Pop Up Shop in Monmouth Street WC2 – talking to customers, speaking at our discussion event “Can smallholder farmers save the world?”, and throwing some shapes at our fabulous free Azonto dance sessions – the Ghanaian dance craze sweeping the world. We were very sorry to see them go (but they were extremely glad to miss the sudden big dip in temperature!). They said everywhere they went how proud they were to be here and to be representing their co-operative – and that their very presence here was a demonstration of how things were changing for cocoa farmers. They loved fish & chips, but hated escalators, they were amazed by Tower Bridge and the fact it could open, and blown away by the size of the Thames. They were delighted by the glimpses of countryside through the train window on the way to Kent, and impressed by buildings, roads, and automatically opening doors. They will be taking all their experiences back with them – and most importantly the impression that growing cocoa is worthwhile, that we in UK love chocolate, and everyone they met loved Divine. In turn they have inspired so many more people here to support Fairtrade and to cherish and value the favourite foods we buy – especially chocolate! This entry was posted on Thursday, March 14th, 2013 at 14:13 and is filed under Chocolate, Church, cocoa farmers, Divine Chocolate, Divine Women, Fairtrade, Fairtrade Fortnight, farmers' co-operative, Ghana, Kuapa Kokoo. You can follow any responses to this entry through the RSS 2.0 feed. You can leave a response, or trackback from your own site.